Bid submissions! Contracts! Project reviews! Project updates! Supply lists! And of course, lots and lots of reports over the course of a project, many done on a daily basis. Traditionally, these have been the purview of managers and site supervisors, but many of these reports require information from multiple parties to complete. Many of these reports have moved from pen and paper to computers, but there are still issues with getting data to where it needs to go in a timely fashion. But now applications have arrived on the work scene. And using the right one isn't frivolous at all. 1. Protect Your Firm LegallyNo one wants to go into business to be sued, but it's an unfortunate part of doing business. If it does occur, it's important to be able to produce professional looking reports that meet industry guidelines. Reports produced in Raken are 100% compliant. 2. Save TimeUsers completing reports in Raken save on average sixty minutes a day. Photos and graphics can also be added to these reports quickly and easily. 3. Provide StorageRaken's cloud platform allows clients to store files for up to ten years safely and securely, with easy access by appropriate parties. 4. Provide Quick Access To ReportsYou need that report now, and it's sitting in the site supervisor's pocket in a little green notebook? 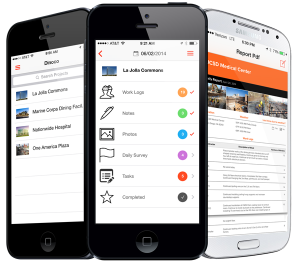 With Raken, once the daily work report for a construction project is written, it can be viewed by multiple parties in multiple locations. 5. Eliminate Extra WorkUnless of course, your staff enjoys staying late, copying over reports or translating data into spreadsheets. With Raken, data is transmitted in the correct format the first time, using mobile phones and tablets. It's not necessary to fear becoming a slave to apps, just a matter of selecting the right ones. And for construction firms, the right one can save them time, money, and frustration.